« Afloat, it steals the surface. 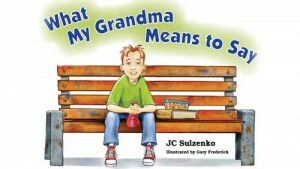 Illustrated in full colour by Gary Frederick, the book lets young readers, ages 8-12, and their families, share Jake’s experience as he watches his grandma change from world traveller, expert birder and best cookie baker to someone who forgets where she lives and cannot remember his name. 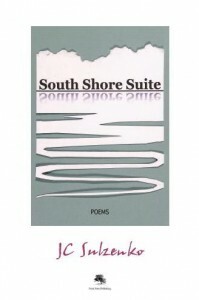 Once Grandma moves to a long-term care residence, Jake becomes her regular Saturday visitor. He develops a routine and knows what to expect when he is with her, until an extraordinary conversation makes him think she is cured. The book takes readers down Jake’s path as he learns how Alzheimer’s disease and related dementias affect not only the people living with such dementia but also people in their families, including the children, who can be drawn into the role of caregivers. 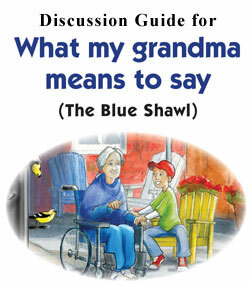 With answers to frequently asked questions and a list of key website where more information is available, the book allows families a way to discuss with their children what is happening in their lives and helps each member of the family develop his or her own strengths and strategies for supporting someone dear to them, who is affected by Alzheimer’s or a related dementia. This entry was posted in Publications, The Book: What My Grandma Means to Say, What My Grandma Means to Say, Whats New. Bookmark the permalink. Trackbacks are closed, but you can post a comment.